← Bose Noise-Masking Sleepbuds: Revolutionary Or Instant Flop? Many sites have talked about the new Bose Sleepbuds, which are making their way into Bose stores this week. But, they have not provided a full review. This is why I was suspicious testing them out today because I thought the reviews must have been so bad that Bose put an embargo on them. The Sleepbuds come with a very classy charging case. Besides the “Shower” track, there is also Swell (ocean wind sounds), Altitude, Cascade (waterfall sounds), Circulate (useless), Downstream, Warm Static, Rustle (wind & leaves), Tranquility (slow music), and Campfire. Unfortunately, you can’t stream your own music or sounds. I thought it was just a cop-out when Bose said their new buds are too small and not powerful enough for playing music. But once I handled and used the buds, I understood where Bose was coming from. The best thing about the new rubbery Sleepbuds is that they fit into your ears comfortably without reminding you they are there. 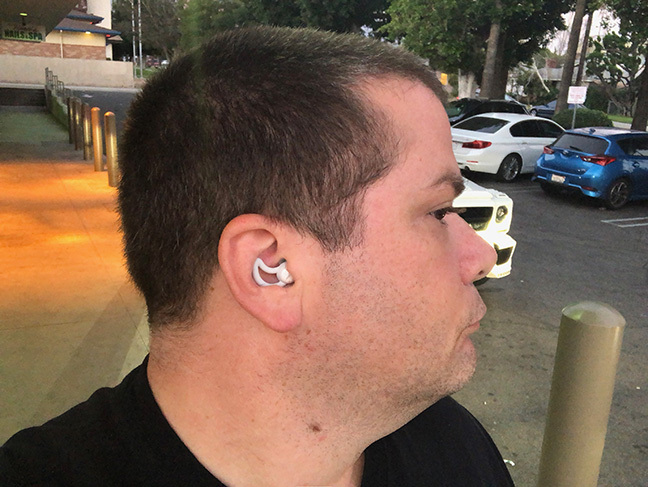 You’ll know what I mean if you’ve use the AirPods, which are about as comfortable as wireless stereo earbuds that play music can get. Sony’s new WF-SP700N wireless earbuds have good sound and decent noise cancellation, but can get your ear canals irritated after wearing them for just a few hours. And the Jabra Elite 65t earbuds may be the best overall, but they are also the most uncomfortable. So, if you are one who sleeps with earbuds or even noise-cancelling over-the-ear headphones, you’ll appreciate the Bose Sleepbuds right away. There are three sizes, and you must pick the one that most comfortably fits in order to get the best results. If you are looking for the active noise cancellation on this product, you are looking for something that simply doesn’t exist. Instead, as Bose properly claims, the buds are noise-masking. They offer passive noise isolation with different sounds that mask annoying sounds such as people snoring, dogs barking, cars crashing, etc. And it works very well. It’s important to note that even the best active noise-cancelling headphones or earbuds don’t keep out all of the sounds, especially at different frequencies. The Sleepbuds can keep out just about all the background noise (unless you are in a very loud place like a concert or a Starbucks with loud music playing). They put you in another world. And the sounds are realistic and relaxing enough without sounding too digitized. Bose's Sleepbuds fit very comfortably into the ear canal. The Sleepbuds aren’t just for sleeping; they are for relaxing almost anywhere or allowing you to get work done without bothersome noises. They are great to wear for people who have ADHD and want to get work done anywhere. In fact, they are currently being used while writing this review at Starbucks (I’m using the Campfire mode now). I don’t want to take them out of my ears because they are so soothing. One of the advantages of the Sleepbuds not being able to stream music or take phone calls is that the battery life is great and can go up to 16 hours in a single charge. The Sleepbuds come with a futuristic case that charges the buds rapidly. In other words, you don’t have to worry about being awaken by a voice that says, “Battery level, low!” like you do with other earbuds and headphones. The only downside to the Sleepbuds is the price tag — $249. 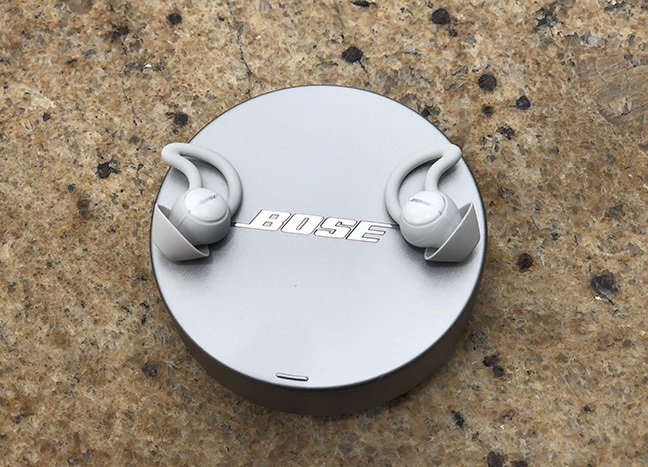 But if you suffer from insomnia, have a hard time concentrating in noisy environments, or just want to escape to relaxing soundscapes, Bose’s newest earbuds are something that you should consider. Many may laugh at the Sleepbuds now, but they will soon be considered a revolutionary product. 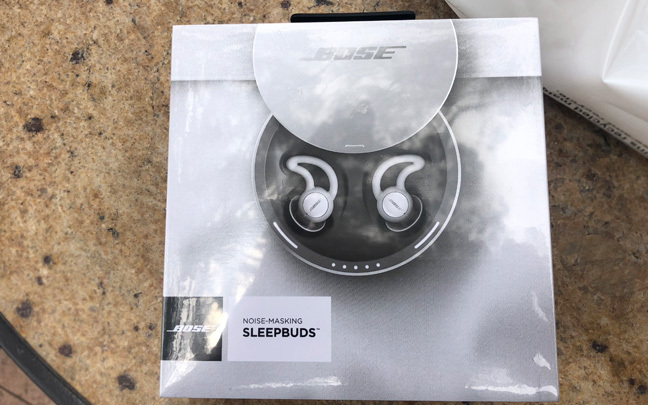 This entry was posted in Review and tagged Bose, Bose Sleepbuds, Headphones, noise-cancelling. Bookmark the permalink.